Look what flew past the kitchen window last night! Mr and Mrs Danica are out and about... I need to get on the stream tomorrow morning!! Look at the size of that thing! Jacques and I got out for a day on a tiny tributary yesterday that flows through crops near my house in Kent. 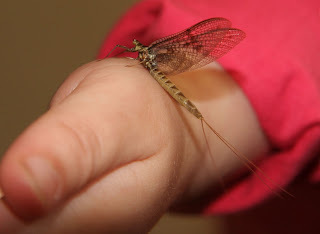 we got a handful of wild browns, grayling and chub on small nymphs and emergers. the hawthorn flies were out in huge numbers with a lot of the dead ones drifting submerged... maybe that's why the fish were pretty difficult.